Assessing the value of diffusion-weighted imaging (DWI) magnetic resonance imaging (MRI) and apparent diffusion coefficient (ADC) in normal bone marrow (BM) tissue as well as in benign and malignant hematological diseases in comparison with BM histopathologic report. A cohort cross-sectional study performed from October 2016 till December 2017 in Al-Imamian Al-Khadimain Medical City. Forty patients were enrolled and segregated equally into two main groups (benign and malignant hematological disorders with another 20 healthy volunteers (control group). Hematology data were recorded for all patients in addition to DWI-MRI and ADC mapping in comparison with bone marrow report for the group of malignant hematological disease in terms of blast cell percentage. Conventional MRI reveals abnormal signal intensity in 85% of the malignant cases with different pattern. While 95% of the benign and 100% of control group had normal signal intensity with P value (P = 0.001). Application of DWI-ADC on three groups of sample reveals a variable range of ADC values which is higher in malignant (225–875 × 10−6 mm2\s) than benign (275–600 × 10−6 mm2\s) and control cases (205–560 × 10−6 mm2\s) with a cut-off value of 550 × 10−6 mm2\s. There was a positive correlation between ADC values and blast % in bone marrow histopathological report with correlation coefficient of 0.75 and P value of 0.05. Both DWI-MRI and ADC are useful in BM assessment. The latter is a quantitative assay for the diffusion and can reflect a functional assessment in correlation with blast cell percentage. Hematopoiesis is a process through which all blood cells are produced from the HSCs (hematopoietic stem cells) inside the bone marrow (BM) . BM composed of cancellous bone trabecule and stromal tissue in addition to hematopoietic cells, and fat . Under normal steady-state conditions, HSCs reside mainly in the marrow cavity, but under certain stressful conditions, they can migrate and colonize other organs such as the liver and spleen as extramedullary hematopoiesis . HSCs comprise 0.01% of total marrow cells as they can proliferate and differentiate into mature cells and maintain themselves . By the fourth year of life, a significant number of fat cells slowly replace hematopoietic elements and expand centripetally and gradually until approximately 18 years of age, where the red hematopoietic active marrow confined only in the vertebrae, ribs, skull, pelvis, and proximal epiphyses of the femora and humeri . This red marrow consists of approximately 40% water, 40% fat, and 20% protein unlike the yellow marrow that consists of approximately 15% water, 80% fat, and 5% protein . Diagnosis of many hematologic diseases depends on invasive bone marrow examination . In acute leukemia, it is important to estimate the number of immature hematopoietic cells (blast cells) . Magnetic resonance (MR) is a measurement technique used to examine atoms and molecules. It is based upon the interaction between an applied magnetic field and a particle that possesses spin and charge . Thus, in principle, many elements can be examined using MR and the basic ideas of resonance absorption and relaxation are common for all of these elements . MRI has a wide range of applications in medical diagnosis in neurological diseases,  as well as other medical fields like musculoskeletal, gastrointestinal tract, and hematology with high sensitivity . The appearance of bone marrow in MRI depends on the amounts and proportion of yellow and red marrow, which changes with age and environmental factors . Bone marrow infiltration in hematological malignancies appears as hypointense in T1 and hyperintense on T2 . Diffusion-weighted image (DWI)–MRI is an imaging method that uses the diffusion of water molecules to generate contrast in MR images. It allows the mapping of the diffusion process of molecules, mainly water, in biological tissues, in vivo and non-invasively. Water molecular diffusion in tissues is not free but reflects interaction with many obstacles, such as macromolecules, fibers, and membranes. Water molecular diffusion patterns can therefore reveal microscopic details about tissue architecture, either normal or in a diseased state . Apparent diffusion coefficient (ADC) is a measure of the magnitude for water molecular diffusion within the tissues and is commonly clinically calculated using MRI with diffusion-weighted imaging (DWI). ADC values are calculated automatically by the software and displayed as a parametric map. Then, by use workstation, ADC measurement is recorded for a given region by drawing regions of interest (ROIs) on the ADC map . The ADC quantifies the combined effects of both diffusion and capillary perfusion. A “decreased” ADC is interpreted as “reduced” flow of water or diffusion, whereas an “increased” ADC tissue indicates no restricted water flow. The ADC has been related to the state of tissue during the growth of tumors or progression of cancer . A cohort cross-sectional study underwent from October 2016 till December 2017in the hematology unit and radiology unit in Al- Khadimain Medical City. It was approved by IRB (institute review board) al Nahrain University/College of Medicine. All patients were informed about the study by taking a verbal consent. It included 40 patients with any primary hematological disease, 20 patients with benign hematological disorder as sickle cell anemia, thalassemia, and autoimmune hemolytic anemia or autoimmune thrombocytopenia, as well as another 20 patients with malignant hematological disease such as acute or chronic leukemias and multiple myeloma. All were examined and diagnosed by consultant hematologists while MRI interpretations were done by a consultant radiologist. Some cases were excluded from the study like those cases of acute and chronic rheumatologic diseases, active infection, life-threatening conditions (shock, bleeding...), and secondary metastasis (solid tumor with or without secondary bony metastasis). All patients underwent bone marrow examination as part of their ordinary hematology workup as well as DWI-MRI. The reported data included demographic data (age, gender, phase of the disease, treatment course) and complete blood count (CBC) with blood film and bone marrow aspirate and biopsy ± blast %. All patients were categorized into two main groups (benign versus malignant hematological disorders) in order to be compared separately with a third group that included another 20 (age matched) apparently healthy subjects, who volunteered as a control group after exclusion of anemia, any drug intake, and musculoskeletal disease. Axial T1-weighted images were obtained for the pelvic region for each patient—using 1.5-T MR in radiology unit with the imaging parameters of 500/14–15 (TR/TE), a slice thickness of 5 mm, and an interslice gap of 1.5 mm, and DWIs with imaging parameters of 5000/101 to 118 (TR/TE), a slice thickness of 5 mm, an interslice gap of 1.5 mm, bandwidth of 79 kHz, duration of diffusion gradients of 31 ms, and gradient separation of 42 ms, in three orthogonal directions. We recorded the ADC values from the solid portion of the infiltration and from normal, areas around it. The ADC values in this study represent average records of two to five regions of interest (ROIs); each ROI was about 100 mm2. The statistical analysis was performed with the statistical package for social sciences (SPSS) 21.0 software and Microsoft Excel 2013. Numerical data was described as mean and standard deviation and standard error, while categorical data was described as count and percentage, in addition, to assess the association between MRI report with blast %, Hb, WBC, platelets, and any correlation between them. The statistical significant difference considered P value equal or below 0.05. Forty patients were enrolled in this study; 24 were males with age range (18–66) year. They were grouped equally under benign hematological disease with mean age (36.1 ± 10.39) ranging 18–60 years and the second group of malignant hematological disease with mean age (37.05 ± 15.52) ranging 20–66 years. In addition, the third group consisted of another 20 healthy volunteers with mean age 41.5 + 11.81 years. Both patients and control groups were gender and age matched with no statistical significance (P = 0.6 and 0.3 respectively). The malignant hematological disorders were distributed between acute and chronic leukemias and multiple myeloma. Both types of acute leukemias compromised 70% of cases (Table 2). Meanwhile, the congenital hemolytic anemia formed the majority of benign hematological disease (70%) (Table 1). The mean Hb level was of high statistical significance between the three groups (P < 0.002), and similarly platelets (P < 0.002) unlike WBC which showed no such statistical significance (P = 0.082) (Table 2). For all patient groups and control group, pelvic unenhanced MRI was performed and interpreted by a consultant radiologist. The reports were classified as diffuse or focal abnormalities in comparison with normal MRI. Diffuse lesions (hypointense on T1 and hyperintense in T2 for iliac bone signal intensity) were found in 55% of the malignant group compared with 5% for benign unlike none of the control group (which is statistically highly significant P < 0.001). Similarly, the focal MRI abnormality was detected in 30% of the malignant group while none of both benign or control group showed that abnormality. In contrast, the normal MRI signal intensity was reported in 100% of the control group, 95% of the benign group, and only 5% of the malignant group (Table 3). Those with normal MRI in the malignant group were examined after chemotherapy course and were in clinical remission. Application of ADC on three groups of sample reveals a range of 225–875 × 10-6 mm2\s with mean 665.88 ± 173 × 10-6 mm2\s for the malignant group while a range of 275–600 × 10-6 mm2\s with mean of 421.38 ± 86 × 10-6mm2\s for the benign group in comparison with the control group range 205–560 × 10-6 mm2\s with mean 395.5 ± 112 × 10-6mm2\s which is of high statistical significance (P < 0.001) (Table 3). 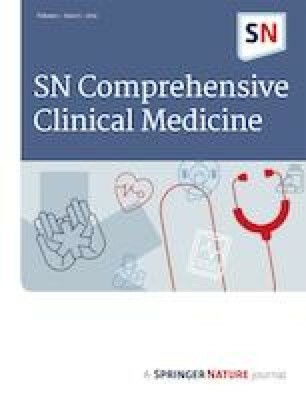 It is shown that ADC being the lowest in sickle cell anemia (305 due to bone marrow necrosis) while the highest mean in lymphoid leukemia and multiple myeloma (768 and 776 respectively); however, normal control cases showed mean value of 395.5. In statistical point of view, it can be said that the cut-off value of ADC was considered 550 mm2\s . Seventeen (17/20) malignant cases showed ADC higher than the cut-off value (85%) while, in the remaining three whose ADC was less than the cut-off value, two of them were in complete remission from the disease after chemotherapy, with one case of bone marrow necrosis (Table 4). Interestingly, only one case of benign disorders (5%) showed high ADC level which is sickle thalassemia unlike the rest 19/20 (95%). It is shown that sensitivity of ADC in terms of detecting malignant disorder is 85% while specificity is 95% with high positive predictive value 94.4 and negative predictive value of 86.4. Those parameters change significantly after exclusion of two remitted cases with a sensitivity of 94.44% and specificity of 95% (Table 4). 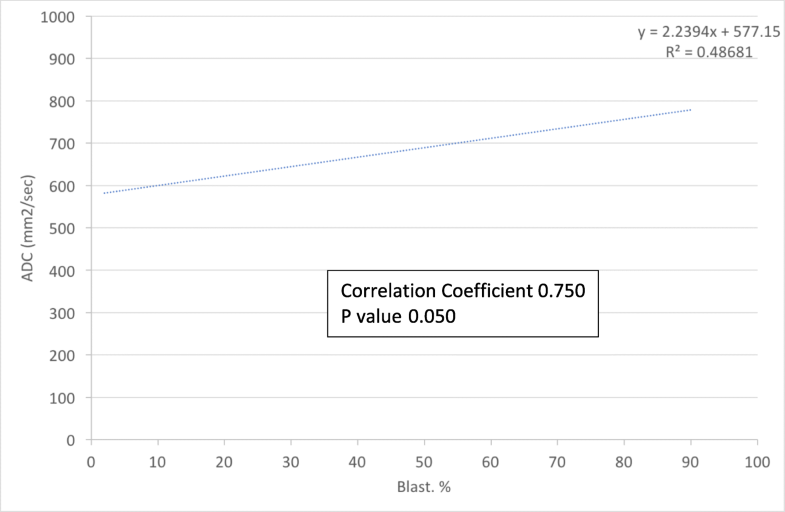 In terms of correlation between ADC and bone marrow histopathology report of blast %, there is a significant correlation (correlation coefficient 0.75, P = 0.05) unlike correlation with other parameters (Hb, WBC, and platelets) (Fig. 1). Hematological parameter review reveals that both malignant and benign patient groups have a low Hb level with a mean value lower in the benign group than that of the malignant group. This can be explained because most benign group samples were of acute presentation of hemolytic anemia, while the mean Hb level in the malignant group is accepted since anemia is frequently under regular transfusion or not necessary manifestation in chronic hematological malignancies . Mean WBC level for both patient groups was higher than normal reference range and similarly in the malignant compared with the benign group. In the malignant group, there was a wide range of WBC presentation which varied from acute leukemia to chronic leukemia that gives a slightly elevated mean level, while leukocytosis in hemolytic anemia is due to marrow hyperplasia secondary to activation of hematopoietic system . Magnetic resonance imaging is the only imaging method that enables direct visualization of the bone marrow with high anatomical resolution. Normal bone marrow SI is hyperintense on T1 since lipid protons have short relaxation times so the fatty marrow appears hyperintense, while, on fat-suppressed T2-weighted images, normal bone marrow SI is hypointense after fat signal suppression . There were significant differences in signal intensity of MRI (T1 and T2) between malignant, benign, and control cases. The abnormal signal intensity (whether diffuse or focal) was hypointense in T1 and hyperintense on T2, which can be understood since marrow infiltration tends to replace marrow fat making the signal intensity completely the opposite of that in normal bone marrow . All leukemias and 2/3 of multiple myeloma had abnormal signal intensity. Focal abnormal signal intensities are found in all acute and chronic lymphocytic leukemia in either one or multiple foci which assumed to coalesce together, while diffuse abnormal signal intensities are found in acute and chronic myeloid leukemias. Multiple myeloma cases had a different presentation of SI on MRI with diffuse abnormality in two thirds and normal SI in one third of the cases . Normal SI among malignant cases was also found after clinical remission; a previous study assumes the result done by Jacob in 2009 (whole body diffusion in detection and monitoring metastatic malignancies) . Only one case has diffusely abnormal SI in benign and control cases which is a case of sickle/thalassemia which presented with acute severe hemolysis. In our study, there were significant differences in the ADC map for the patients and control cases. All the control cases have an ADC of less than 550 (the cut-off value), which overlapped by ADC values for the benign group with slightly higher mean value and that reflects the reactivation of red marrow in the majority of those cases and since red marrow has a higher water content (40%) in comparison with yellow marrow (15%) and the ADC which is a measure of water diffusion, then those cases would have higher ADC values . Sickle cell anemia had an ADC mean lower than that of normal bone marrow and other benign hematological disorders and this attributed to high prevalence of marrow necrosis in those patients . ADC values for malignant hematological diseases had different mean values for each group. Lymphocytic leukemia had a higher level of ADC in areas around the focal infiltration of the bone marrow in lymphocytic leukemias. They were lower than those obtained from the foci but still higher than normal bone marrow ADC in comparison with myeloid leukemias which had a lower mean value for ADC. Thus, the chronic form of leukemias have a mean value higher than that of acute leukemias. Diffusion-weighted imaging is not a pure diffusion imaging technique, and ADC is an artificial parameter that reflects both molecular diffusion of water and microcirculation of blood in capillaries (perfusion) . Previous researchers did not take into account the effect of perfusion when they speculated that tumor-related hypercellularity leads to a decrease or no change in the ADC of bone marrow except one study done in Tokyo by Yoshie Nonmura at April 2001 (relationship between bone marrow cellularity and apparent diffusion coefficient), where 66-sample group were taken and subdivided into four main groups including normal and hypo- and hypercellular marrow with diagnosed lymphoma cases, but no bone marrow sample was taken in that study and it gives a different ADC values from our study with cut-off value of 800 and mean value for lymphoma cases 1300 and that difference explained by the use of a pediatric age group sample which made the cut-off value higher and the use of lymphoma cases as sample for hematological malignancies which were also excluded from our study . However, it assumed that less cellular marrow has less diffusion effect than normal cellularity marrow which may be secondary to the overall water content inside BM compared with fat cells. Adult BM histology consists around 30–70% from fat cells, and therefore, any condition results in increasing or decreasing hematopoietic BM cell will give a corresponding decrease or increase in the number of fat cells respectively. Thus, a cellular marrow has more intracellular water and adjacent free water than less active marrow. Accordingly, there is more room for molecular diffusion in cellular marrow than less cellular BM . There are some limitations encountered in this study like the small number of BM samples. This can be simply explained that getting a BM sample is limited for those indicted cases only. In addition, the ADC values may vary according to treatment effect as well as ongoing infection etc. In conclusion, technique of DWI-MRI is a noninvasive technique that requires no contrast medium, with relatively short examination times to help in anatomical and functional assessment of BM. It can give more quantitative evaluation for the BM functional capacity with the use of ADC with reliable determination of treatment response after chemotherapy induction in acute leukemia patients. It is approved by IRB (Institute Review Board) al Nahrain University/College of Medicine, and all patients were informed about the study by taking a verbal consent. All procedures performed in studies involving human participants were in accordance with the ethical standards of the institutional and/or national research committee and with the 1964 Helsinki declaration and its later amendments or comparable ethical standards, as well as IRB (institute review board) al Nahrain university/college of medicine, and all patients were informed about the study by taking a verbal consent.